The cornerstone of the TalkPath News Facebook group is a shared understanding of the challenges that come with living with aphasia. It serves as a place to connect and share ideas, inspirational stories and quotes, current goings-on, and to have a few laughs. We share articles from our TalkPath News platform, which are written and designed to be aphasia-friendly, making the news stories easier to understand for those with communication challenges. Polls posted in the group allow members to respond with their opinions independently, ultimately fostering a deeper feeling of independence and autonomy. The Life Participation Approach to Aphasia (LPAA) aims to help patients return to an active life as akin to their pre-aphasia circumstances as possible. Part of this is returning to engagement in community activities, including social media. Lingraphica conducted a study to assess the benefits of social media engagement on adults with aphasia using both the TalkPath News app and the closed TalkPath News Facebook group. We asked a group of volunteers from the TalkPath Live group and The Snyder Center for Aphasia Life Enhancement (SCALE) in Baltimore, MD, to provide information about their confidence in communicating, as well as the impact this has on their interpersonal connections and relationships. With the help of their SLPs and/or caregivers, the participants used the TalkPath News app to post and share current event news stories as a springboard of conversation onto the TalkPath News Facebook group. Following a five-week period of engagement utilizing both platforms, the participants were asked the same set of assessment questions. Our study showed an overall increase in patients’ confidence in their own communication abilities during post-participation assessments, with a mean improvement noted in six out of eight respondents. Following the study, membership in the Facebook group has more than doubled, with new members joining from around the world. This year, TalkPath News will celebrate its third anniversary, with over 2,000 news stories adapted and shared with the aphasia community and over half-a-million page-views, and its reach has only been broadened through the quick-sharing abilities and global reach of social media. 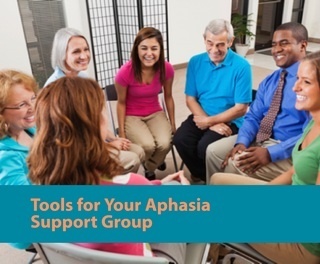 Our mission is to continue to share these tools and outcomes, and to engage more adults with aphasia in similar communities. We aim to provide more guidance to people with aphasia, caregivers, and professionals across social media platforms, ultimately decreasing isolation and increasing communication confidence and independence. 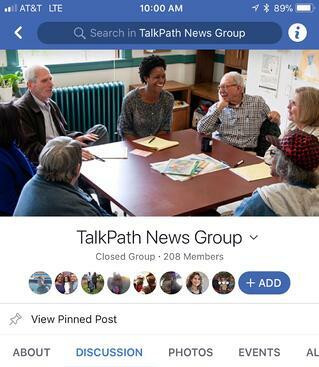 We encourage you to share the TalkPath News app and the TalkPath News Facebook Group with your clients who might enjoy the online engagement!